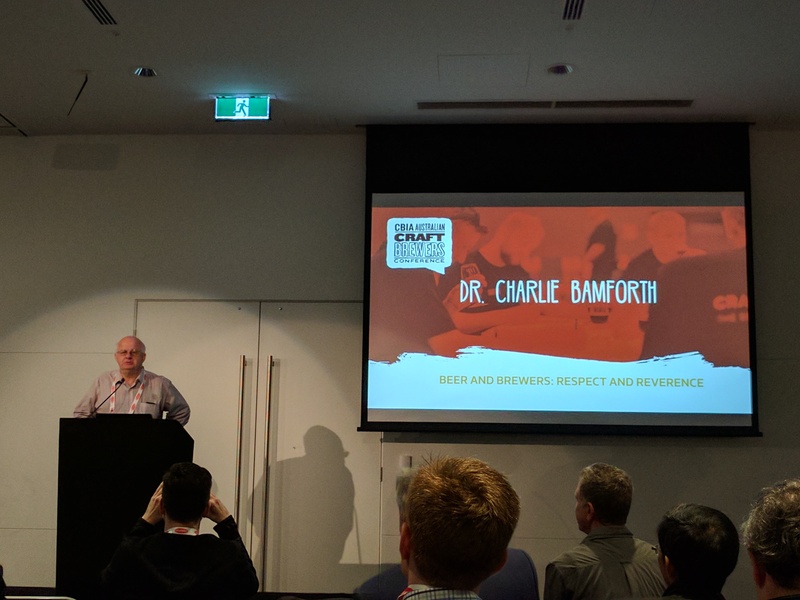 In introducing Dr. Charlie Bamforth as the keynote speaker for this year’s Australian Craft Brewers Conference in Adelaide, Pete Mitcham wisely opted to forego the long introduction, allowing for more time for us to hear from the man himself, the Distinguished Professor of Malting and Brewing Sciences at UC Davis and basically THE expert when it comes to beer. Whether you’re a brewer in a large or small brewery much of the concerns are the same, Charlie said, those concerns around the ingredients and the quality of your beer. The quality of your beer, Charlie emphasised, isn’t dependent on brewers alone but every single person in the brewery. “Everybody is important,” he said and that it was “critical” for a brewery to look after their people and to ensure they are trained, happy and proud to be part of the brewery family. Another key to the quality of your beer, Charlie said, is consistency and balance and that quality isn’t necessarily about the complexity of flavour. When asked, “what is a good beer?” Charlie says he responds with “I have no idea.” Perhaps you’d expect a far more complicated answer from someone with the words “distinguished Professor” in their title but he simply says, “what’s good for you may not be good for me.” Beer is subjective and no-one should be criticised for their choice of beer, whether it’s craft or not. Whilst saying clearly he did not think there was anything wrong with a small brewery being purchased by a large one, Charlie felt it should be “transparent” so consumers know where the ownership lies. Maybe the beer industry could learn something from the wine guys when it comes to celebrating their raw ingredients. Crazy ingredients like oysters or chilli and other pushing-the-boundaries additions are great but, Charlie commented, “we have so much to celebrate in the basic raw materials” and whilst wine has been doing a great job in making grapes the hero of their industry perhaps we in the beer world should be making more noise about ours too. Charlie’s comments popped back into my head when Dr. Ina Verstl, the editor of Brauwelt International who spoke after Charlie, quoted a statistic that said 88 percent of people in Australia didn’t know what ingredients are in beer. Charlie recalled ordering a beer at a restaurant recently and the waitperson asked if he wanted a glass. “Why do you ask?” Charlie replied. “Cause we don’t have very many glasses and we don’t want to run out,” she said. Now imagine he had ordered a wine. That conversation wouldn’t have happened. This short interaction highlighted the huge differences between the perception of beer and wine in restaurant experiences in general. Whilst wine has a sense of theatre around it, most of the time beer doesn’t even get a glass. The Australian Craft Brewers Conference continues today and then Craft Beer Awards are held tonight at Adelaide Oval, stay tuned to the girlplusbeer Twitter feed for the results (mostly) live. Off topic of this thread however i just wanted to brag that i got to meet and taste the white port you reviewed at Rocky Ridge Brewery. Man what a drop and how cool is Hamish. Nice recap! Beer should be put in a glass and admired, in my inexperienced opinion. Is there a resource you’d recommend to learn about ingredients in beer and how it is made? Thanks Aimee! I think the best resource is your local brewery if they offer tours and events and there’s a fantastic book called Tasting Beer by Randy Mosher which is pretty well and one-stop shop!